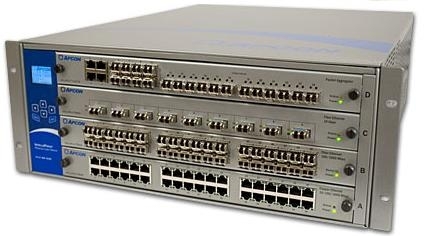 INTELLAFLEX is a Packet Aggregator blade that adds aggregation and filtering capability to APCON’s INTELLAPATCH Series 3000 switching solution. This blade allows users to aggregate multiple data links from network SPAN, Tap or mirror ports, and filter and direct only the desired traffic to specific monitoring devices. In this way, users are able to electronically share expensive monitoring devices (such as analyzers and IDS) – often across multiple locations – while preventing oversubscription and data loss. Supporting up to 144 ports in 4U, INTELLAFLEX offers the highest port density in a single chassis – easily accommodating large enterprises that typically have hundreds of SPAN ports and Taps in their networks. INTELLAFLEX also offers the highest port aggregation density, with a maximum of 120 1G ports and 32 10g ports in a single chassis.